I think it was a few weeks ago that I was asked if I could do one of these, and of course I can! However, when I was going to take the pictures for this post I remembered that I’d very cleverly cleared away all my stuff for the holidays. This will therefore be an overview of what I would usually put in there, what purpose it serves etc. 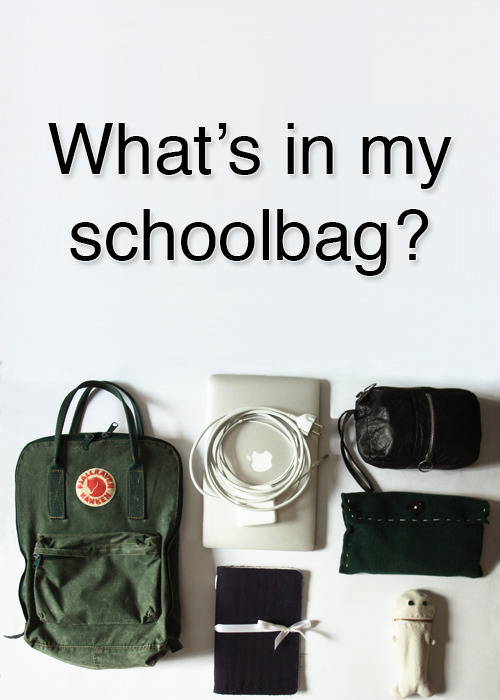 I also keep a separate canvas bag with me where I carry my binder, a notebook and maybe a textbook. But enough with the babbling, let’s have a look at my backpack! So this is my backpack. It is a battered and well loved Fjellreven backpack, which is probably older than I am. Together with the canvas bag I use, it holds everything that I need, and it is a very practical size to carry around. It has one-man compartment, with a very thin laptop pocket that is probably not a laptop pocket. There is also one zip compartment on the front, and two vertical compartments on the sides, where I usually put my water bottle and umbrella. I always bring my laptop to school, as we usually work on our computers in class and take notes on them. My macbook air is very practical for this as it is super lightweight and very small, making it ver portable. And of course I also bring my charger. This is my fauxdori, which holds my current bullet journal and my little blog book. I am not completely happy with the setup, so we’ll see how long it lasts. And I mean, erhm, if I happen to get a moleskine for christmas… Then I might use that one. And by the way, the first post of 2015 will be a bullet journal post, so get excited! This is without a doubt the most random thing in my bag. It is a pouch, that was actually my dad’s in the 80s, and it just holds a bunch of random stuff. Painkillers, lipsticks, hand cream, stickers, safety pins, a book lamp. You name it, it is probably in there. I just carry this around in case I happen to need something in it. This is the bigger of my pencil cases, where I keep coloured pens, whiteout, extra of everything. Yeah. This is my main pencil case, which holds my most used writing utensils, an eraser, my ruler etc. I actually did a What’s in my pencil case(s) post, if you want to get a more detailed look at the contents. And that is everything I carry around in my backpack! As mentioned I carry a binder, textbooks and notebooks as well, but those go in my tote and are really just very generic. 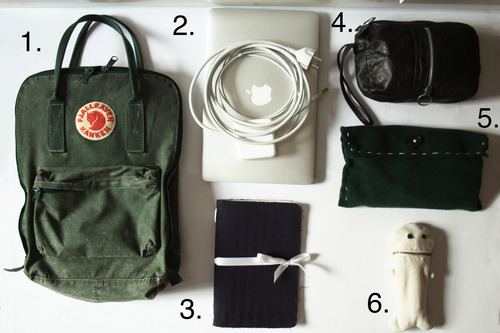 Now, I am very curious as to what you guys see as an essential to bring with you to school or university! Tell me about it?